Everyone is aware of the many changes in our society but do they realize that one of the biggest changes is the work in the woods. What would the women today do, if not only, their neighbors’ husbands went to work but their own as well. Years ago almost every man went into the woods for a long time. Their wives would stay home, look after the children, crops, the farm animals and mend the clothes. They knew their husbands would not be back home for quite awhile. Today the men have big tractors, porters and what not to work in the woods, but years ago they did everything by cross-cut saws, teams of horses and sleds. The young boys could hardly wait to go to the woods and when the flu struck our parish, the young boys were overjoyed that the school was closed and their fathers took them to the woods for an extra hand. One place that men worked at this time was Bernard McCormack’s. The drive came down the Dungarvon and Renous Rivers. At one time the only means of making a living was fishing, farming or working at the mills. 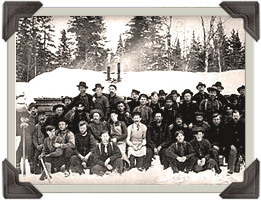 The men worked hard all year round, leaving for the woods in the fall and cutting until Christmas. After Christmas, they would haul most of the trees to the riverside and drove them down the river which was called the spring drive. Later they peeled the pulp of it’s bark. In 1896 there was a contract for round pulpwood. The price was $2 a cord. $2 then was worth $200 today. Payments were to be made when the wood was delivered to Chatham and measured there by the company’s inspector. Any small or knotty wood would not be made until this agreement was presented at the Company’s Office in Chatham. Young boys that worked in the woods with their fathers were not given their pay but it was immediately given to their fathers to pay for their board and keep. For every 1000 logs the men got about 7 or 8 dollars. “D” is for danger we always stand in. Goes forth to hunt a man.